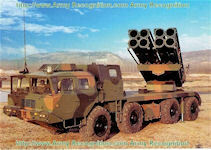 The AR3 multiple launcher rocket system can fire both 370 mm and 300 mm rockets by using launching-transporting container system. 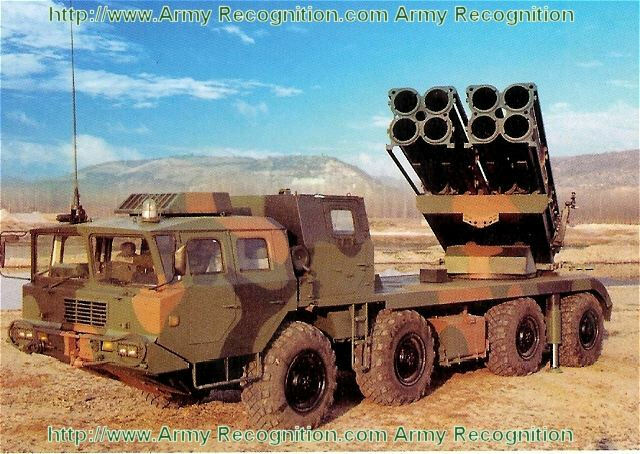 The new AR3 Multiple Launch Rocket System with two four-round rocket pods was being marketed in 2010 by China North Industries Corporation (NORINCO). Based on an 8 x 8 chassis, it is able to fire guided and unguided 300 mm rockets and a new 370 mm calibre guided rocket. Designed for deployment at battalion or battery level, the AR3 can also be operated as a stand-alone single launcher. Reaction time is 20 seconds at battalion level or 15 seconds at battery level. According to NORINCO, it features an advanced meteorological survey system, command-and-control system and support system, as well as a high degree of automation, but no details were given. Company documentation cites a laying accuracy of 1 mil and a circular error probable of less than 50 meters. With guided rockets and simple controlled rockets, the AR3 MLRS features long range, high firing accuracy, great battlefield coverage, mass and violent fire-power, high lethality ammunition, as well as highly automatic operation, short fire reaction time, high mobility and high survivability. By accurately suppressing and eliminating enemy strong-point, area targets and concentrated targets with instantaneous and intensive fire-power, AR3 370 mm / 300 mm MLRS provides significant campaign and tactical values. The AR3 MLRS can execute fire missions normally by battalion or battery as its basic firing unit, yet it can also execute fir missions autonomously by single launcher. With advanced meteorological survey system, command & control system and support system, effective fire assault and neutralization of various ground targets can be implemented.